Future Active Shooters are Present Among Us! 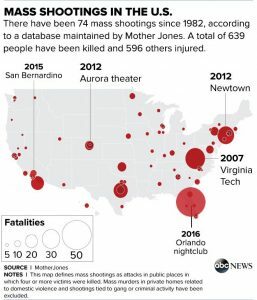 Look at this chart of mass shootings in the U.S. since 1982. Unbelievable! Four or more had to die to make that list. It doesn’t include instances where three or fewer were killed. So don’t think for a moment it can’t happen personally to you. An active-shooter situation is a clear and present danger to you, your family, your friends and your coworkers, regardless of where you live. 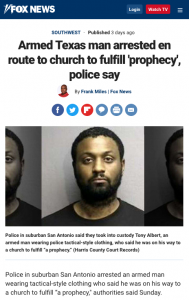 I saw this just last week, some numbskull in Texas was headed to shoot up a church congregation but was thankfully stopped. The mass murder was foiled, but it should be a sobering wake-up call to us. It’s a fact that you could be in danger at church, the mall, a restaurant, a theater… any public place. Yet few of us know what to do in the first few seconds, and, quite frankly, it could mean life or death. We’re not trying to scare anyone. We know our days were numbered before we were born. And we can’t add time to our preordained lifespan by worrying. But we have to take the whole counsel of God, and the Bible also says not to put the Lord to a foolish test…we are to be wise and consider our steps. 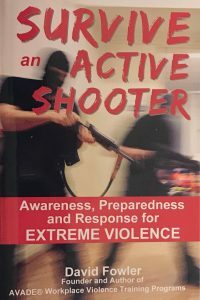 You can watch Dave Fowler’s presentation titled STEELING YOUR BODY, available March 2019, on what to do if you find yourself in an active-shooter situation. You’ll learn what’s the first thing to do if God allows you to be in this situation. It’s time to think a little differently, live smart, or we might end up paying a steep price. It’s hard to believe we even need to discuss this topic. but if you ever needed this info, you’ll be grateful you learned it!